In this Part we will explore the meaning of the 40th Shloka of Sri Vishnu Sahasranamam. The word ‘kshara’ means decay or destruction. Based on this Sri Adi Sankara defines this Nama as ‘Vigatah ksharah naasho yasyasau viksharah’ meaning ‘One who does not decay’. He is ever-fresh and ever the same hence He is called Viksharah. We have earlier seen the same ‘Avyayah’ with the same import. Sri Parasara Bhattar gives the interpretation that Bhagavan’s showers his blessings on His devotees and his love for his devotees is boundless and hence, He is Viksharah. 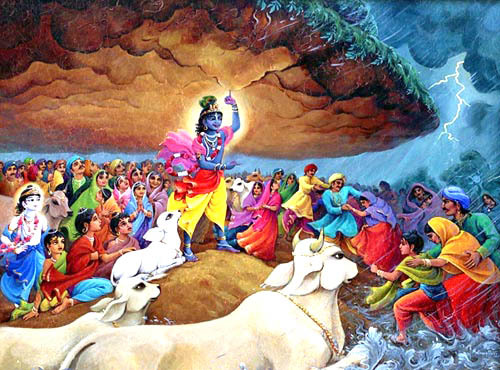 He is steadfast in his love towards his devotees. He even swapped places with Sakkubai (who was tied to a Pillar in a locked room) to allow her to visit her Lord, the Pandharpur Vittala. 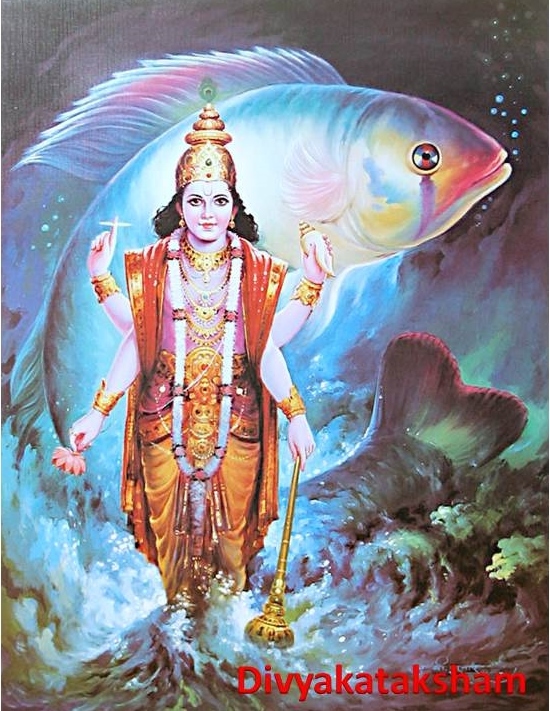 Sri Adi Sankara says ‘ Svachhandatya Rohitaam Murthi Matsyamurthi va Vahana Rohitah’ referring to to His Matsya Avataar, a reddish hued fish called Rohitah that He assumed at his Will. Though Mahavishnu is dark blue in colour there are certain Avatars where he assumed a red or lighter complexion such as in Vaamana Avatar or Balarama Avatar as per his Will. Meaning: I have seen the glory of SRI, the consort of the Lord; I have seen His bewitching body that is Azure as the Sea; I have seen His brilliance like that of the Sun; on His one hand, He holds His Divine Sudharsana Chakra that reverberates in the battlefield and on the other He holds the divine Conch. The Golden colour of SRI and the dark hued Lord’s colour are so nicely superimposed that it appears like that of Sun’s rays on lustrous Emerald stone. Meaning: I see the lustrous Lord standing in Tirucchengunur with Lotus eyes, Lotus feet, Lotus hands, Lotus navel, and Lotus chest, coral lips and red attire, and an auspicious red crown; His radiant form with ornaments and five weapons fills my heart.Sri Satyadevo Vasishtha derives the meaning from the root ‘ruh – bIja janmani prAdurbhAve ca’ – to grow, to increase, to rise, to reach, and gives the interpretation “prAdurbhavati iti rohitah – One who expresses Himself or One who causes all beings to express themselves is Rohitah. Sri Adi Sankara gives the intepretation that He is Maargah because He shows the way for the attainment of Supreme Bliss – ‘Mumukshavah tam devam maargayanti iti Margah’. Paramaanandah yena Praapyate sa Margah iti vaa – Those who desire Liberation always seek Him hence He is called Margah or He is the instrument for giving true joy and hence He is called Maargah’. 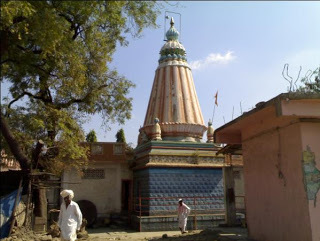 Maargyate iti maargah – He is Maargah because He is always sought after by His worshippers. Sri V.V. Ramanujan gives reference to Thiruvai Mozhi Nutrandaadi 91 – “Taal adaindaar taingatku thaane vazhit-tunaiyaam kaala-megattai” – He accompanies and shows the way to those who have surrendered to Him. 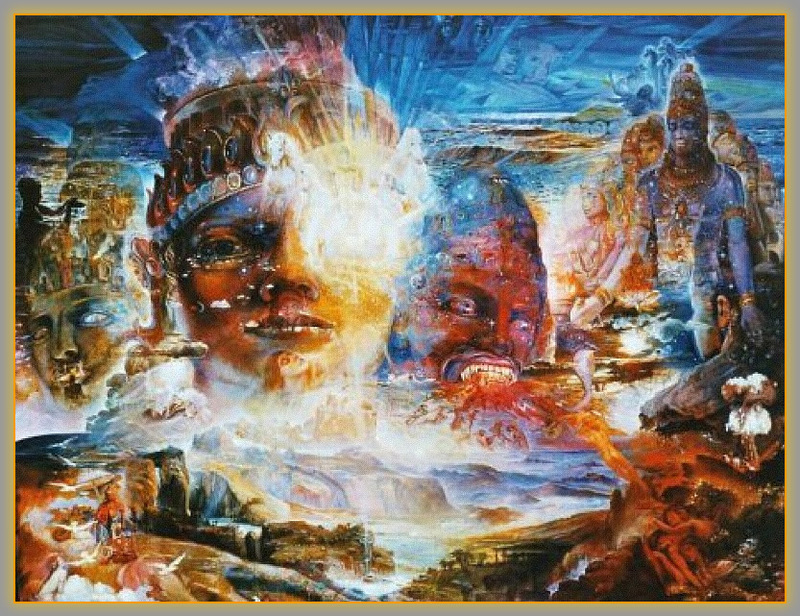 Sri Radhakrishna Shastri gives another aspect – After the Universe disappears at the time of Pralaya or Deluge, it is He who paves the way for the world’s re-emergence. Sri Adi Sankara defines this as ‘Upaadaanam Nimittam cha kaaranam Sa eva iti Hetuh – He is the primary and secondary cause for everything hence he is called Hetuh’. For everything that we observe in the world there is a material (primary) cause and an instrumental (secondary) cause. In traditional logic or Tarka Shastra, “Causes” or “karanas” are divided into two categories, namely: “nimitta” and “upaadaana”. We need the earth or clay as a material to make a pot. So earth is the upaadaana for the pot. But how does it become a pot? Does it become a pot by itself? It has to be shaped by a potter. So the potter is the instrumental cause- He is the nimitta. When we take the Universe as an entity it is made of Bhagavan and made by Bhagavan, hence He is truly Hetuh, the Cause of the Universe. The Dharma Chakram writer nicely distinguishes between Bhagavan the Cause, and Bhagavan the Effect. He points out that, in general, we see the effects but not the cause as easily. This is true in the different aspects of life – we use the Universe, but we don’t understand Bhagavan who is the Cause of the Universe. We see the body, but we don’t see the five elements which are the constituents of this body. He is visible only to the yogis and the jnanis as the Cause of the Universe. 1. Udare daamaani asya iti Daamodarah – One who has all the worlds in His belly. He became famous by the name Daamodarah because he was tied by a rope around his belly by his mother Yashoda. 3. Damaadi Saadhanena udaraa (utkrishtA) matih (yA tayaa gamyata) iti Daamodarah – One who is known through the mind which is purified (udarA or utkrishta) by means of self-control (dama) and other qualities. Yogis train their mind to lead them to Bhagavan, so this Nama means One who is reached by practicing dama. He gives the support from MahaBharata which says ‘Damaat Damodaro Vibhuh – He is called Daamodara by virtue of dama’ (Udyoga Parva 5.69.8). He was not content with swallowing the Earth; he drank Pootana’s life along with Milk from her poison-smeared breast. Still not satisfied, He stole and ate up all the butter. For this mischief, his mother Yashoda punished Him by binding him to a big mortar with a rope. He patiently allowed Himself to be bound like a child. Sri A. Srinivasa RaghavAcharya Swami points out that the act of Bhagavan willingly getting Himself tied around with a rope just demonstrates that He becomes a Bhakta-para-tantran i.e., He subjects Himself to His devotees’ wishes. In this case, He subjected Himself to Yashoda’s wish that He be constrained by the rope. He innocently shed tears when He was being tied in order to please her. Sri Parasara Bhattar gives his interpretation based on “Devaanaam sukha samshitvaat Daamaat Daamodaram viduh” (Udyoga Parva 5.71.9) meaning The Devas know Him as Daamodara because He gives “Dama” (joy and happiness) to them by coming to their rescue when they are harassed by the Asuras. Sri Radhakrishna Shastri points out that the contrasts in this Nama. It has the greatness of Bhagavan having the whole Universe inside Him while at the same time it shows His humility in submitting to be tied by a rope and contained by His devotee. The Dharma Chakram writer very nicely remarks that the One who was tied by the rope can be known only by “tying” or controlling the pancha indriyas or the five senses and directing them towards Him and His service. Sri Adi Sankara interprets this Nama in two different ways as ‘Sarvaan Abhibhavati Kshamate iti vaa Sahah’. The first meaning is that He can withstand and repulse any attacks on him. Here the word ‘Sah’ is used to mean withstand. The second meaning is that he can forgive and forget any amount of offences if the offender repents and seeks for forgiveness. Here the word ‘Sah’ is used to mean ‘to forgive’. Sri Parasara Bhattar links this Nama to the previous one by pointing that ‘Sah’ also means passive acceptance and He patiently submitted to being tied by a rope as Daamodara. Meaning: The Lord is easy to reach by a devotee through love while He is hard to get for others. He is always amenable to Lakshmi. He allowed Himself to be bound easily to the mortar for stealing butter and submitted Himself with a pleading innocent face.Sri Radhakrishna Shastri points out that He bears the burden of the Universe for the sake of the welfare of the creatures in the Universe. The Dharma Chakram writer points out that He patiently waits till we attain the maturity required to reach Him and be United with Him. He also refers to the incident where He put up with Sishupala’s abuse for a hundred times because He had given His word to Sishupala’s mother to that effect. This Nama occurred earlier as Nama 319. The meanings given earlier were that He supports the Earth by ridding it of evil-doers and that He accepts the Pooja from His devotees. Sri Adi Sankara gives a slightly different interpretation this time saying that He bears the Earth in the shape of mountains. He says ‘Maheem Giriroopena dharati iti Maheedharah – He bears the weight of the earth in the form of mountains’. 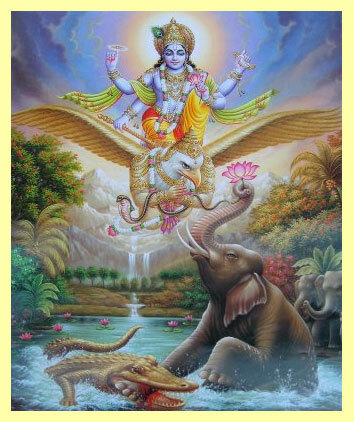 He also refers to the Vishnu Purana quoting – ‘Vanaani Vishnur girayo dishasca’ – (2.12.37) – The forests, mountains and directions are all part of MahaVishnu, ‘Sarvam Vishnu mayam Jagat’. He bears the Earth by propping it up in the form of mountains. Mountains play a considerable role in stabilising the earth and in that sense they sustain the Earth. 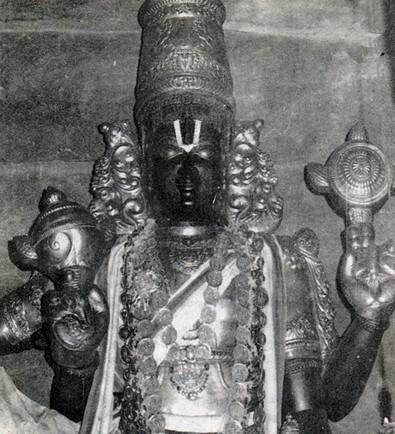 Ultimately it is Vishnu who plays this supporting role. 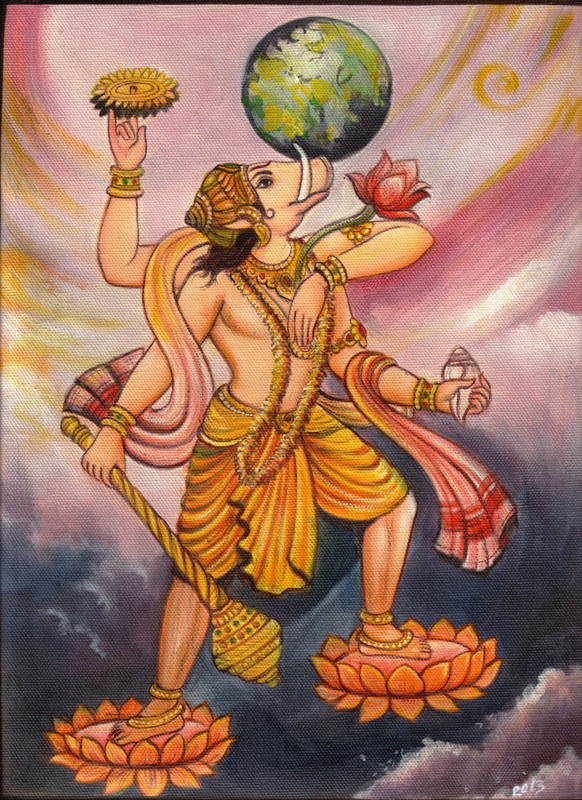 Meaning: He supported the Earth between His tusks in His Varaha Avatar, so He is ‘Maheedharah’. According to Sri Adi Sankara, ‘Svecchayaa dhaarayan deham mahaanti utkrishtaani bhojanaani bhaagajanyaani bhungte iti Mahaabhaagah – Taking various Avatars of his own Free Will He enjoys many offerings rendered to Him by virtue of the roles he played in those Avatars’. For e.g. In Krishna Avatar he enjoyed the main sacrificial offering during the Rajasooya Yagna, performed by the Pandavas. Sri Sankara’s second interpretation is ‘Mahaan bhaagah bhaagyam asya avataareshu iti vaa Mahaabhaagah – He gets the best of everything during his incarnations hence He is called Mahaabhaagah’. 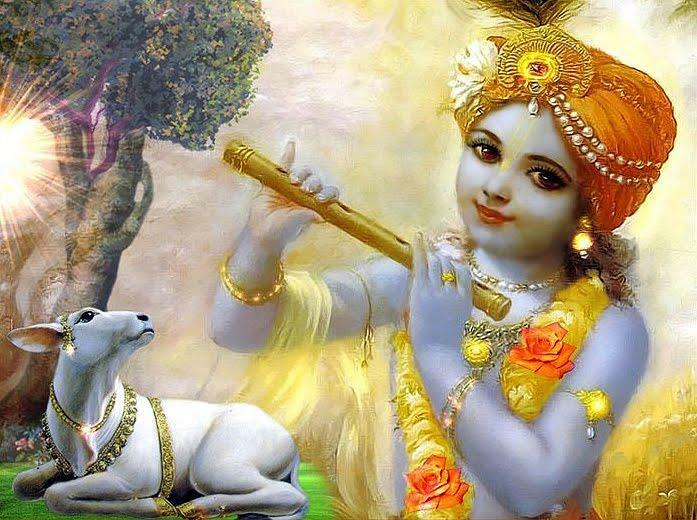 Sri Parasara Bhattar explains that Lord Krishna has the good fortune (Maha Bhaagya) of being chosen by the cowherdess Neela, Rukmini, Satyabhama, Jaambavati, sixteen thousand celestial damsels and others. Meaning: The beautiful and peerless Lakshmi Devi and Bhooma Devi serve by pressing your Lotus feet. Sri Radhakrishna Shastri points out that He is MahaBhaagah because He gets the major (Maha) portion (Bhaaga) of any offering as He likes. He refers to the offering by the Gopas to the Govardhana Giri instead of offering it to Indra at the insistence of Krishna. 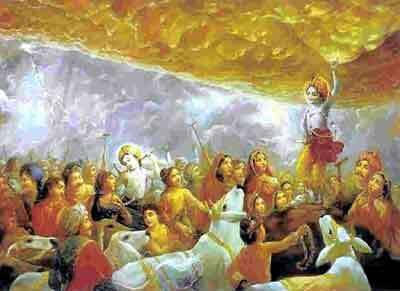 Lord Krishna appeared at the top of the Govaradhana Mountain and accepted all the offerings. Vega means speed and Vegavaan means somebody who acts with speed in any situation. As Shankara puts it ‘Vego javah Tadvaan Vegavaan – Vegah means speed and Vegavaan is one who displays speed in all his actions’. 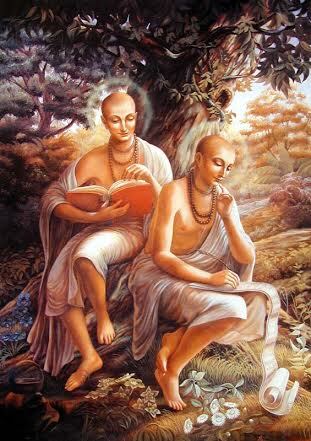 Sri Sankara interprets the Nama in terms of the Isavasya Upanishad Mantra:”anejadekam manso javeeyah – He is unmoving, but at the same time faster than the mind”. The context here is that even though He is inside us, no amount of reasoning with our mind, can we decipher Him or figure Him out. He cannot be understood by logic and reason alone, since even a lifetime of reasoning with the mind that is faster than lightning will not result in realising Him. Sri Parasara Bhattar points out that even when He was a child, Krishna’s actions were displaying His irresistible Supremacy and Lordship. Sri V.V. Ramanujan refers us to the incident of Putana, Sakataasura, lifting of Govardhana Giri at the tip of His little finger, etc. Thiruvai Mozhi 6.4 describes these incidents. Sri Radhakrishna Shastri points to the incident of Rukmini Svayamvaram as an example of his quickness of action at play. Swami ChinmayAnanda gives the interpretation that He reaches His devotees instantly i.e. the moment they think of Him because He is everywhere and all-pervading. We have seen the Lord’s quick response to the distress calls of Gajendra (Gajendra Moksham) and Draupadi (Vastra Haran). 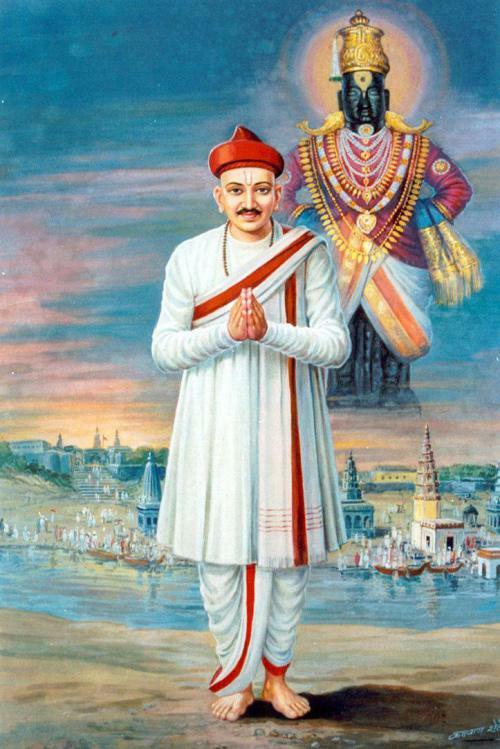 Damaji Pant was a great saint who was living near Pandharpur in Maharashtra. He used to work as the revenue official for the Muslim King of Bidar by maintaining the stock of grains in the Depot at Mangalwedha. He was very pious, kind hearted and always immersed in Harichintana. Damaji would offer food to pilgrims every day before taking his meal. He was a great Bhaktha of Lord Vittala. His wife was very cooperative and devoted. Once there was a great famine in that region leading to people and cattle dying of starvation. On one afternoon, there came a Brahmin at Damaji Pant’s door at lunchtime. Damaji Pant invited him to take food with him and the other guests. While eating, the Brahmin began to cry. When asked for the reason of his sorrow, he told that his family was starving at Pandharpur, but he was eating heartlessly. Damaji Pant assured him that he would give him a lot of grains to take for his family. After lunch, he was given bags of grains, which were loaded in the bullock cart to be taken to Pandharpur. On the way to Pandharpur, many starving poor people attacked the Brahmin and took away his grains. When they learnt that, the Brahmin had received the grains from Damaji Pant at Mangalwedha, a huge crowd assembled in front of Damaji Pant’s house and piteously requested for help. His wife too suggested that the poor and starving people should be helped.On listening to their plight, Damaji Pant opened the store house of the King and asked them to take as much grains as they needed. The Brahmins then blessed Damaji Pant and took all the grains from the store house. On hearing this all the people from Pandhari came to Damaji asking for grains and he gave them all whatever grains was left in the store house.The people of Pandhari were all praise for Damaji and held him in high esteem. A Mazumdar (Assistant Tax Collector for Damaji) then wrote a letter to the King of Bedar saying that Damaji had distributed the King’s grains to the poor in Pandharpur. As soon as the King learnt this, he was full of rage asked how could Damaji do this without taking his permission and sent his soldiers to demand money from Damaji for the grains. The King also told the soldiers to arrest him if he fails to pay the money. The King’s soldiers then came to Mangalvedha and showed Damaji the Royal command. Damaji asked them to arrest him and take him to Bidar. He requested them to allow him to visit Lord Vittala and Rukmini temple in Pandharpur on the way and the soldiers acceded to his request. On reaching Pandharpur he bathed in the Chandrabhaga river and went to the temple, prostrated and told Vittala that this may be the last time he visited his temple as the King may give him death sentence for his deed. Vittala on hearing him took the form of Damaji’s servant and wrote a letter in Damaji’s handwriting to the King and went to Bidar in an instant. He had calculated the value of the grain and took the required amount of money with him. He told the Palace guard that he has come from Mangalvedha and would like to meet the King. The King then called him inside and Vittala saluted the King. He informed the King that he is Vithonaik, the servant of Damaji, and he gave him the letter written by Damaji which said that he had sold the grains for a huge profit and that he had sent the money through his servant Vithonaik and asked him to send him back with the receipt. The King was extremely happy to hear about his loyal official and felt ashamed about his hasty and erroneous decision to arrest Damaji Pant based on a complaint without making an investigation. He thanked Vithonaik and arranged for the issue of receipt to Him and also presented ornaments, a horse, an elephant and Silk clothes to be handed over to Damaji Pant. Vithonaik took everything and went to Mangalwedha and handed it over to the family of Damaji Pant and disappeared. The King’s soldiers in the meanwhile brought Damaji to the Court. The King on hearing that Damaji was coming to the Durbar rushed to receive him. The King embraced him and told him that he was sorry that he had listened to the Mazumdar and had ordered his arrest. He also told him that his servant Vithonaik had given him all the money and that he had sent gifts for him through his servant. Damaji was astonished and said that he had no servant by name Vithonaik and that he had not sent anyone with the money. The King then showed him the letter written in Damaji’s handwriting and also the money that was given by his servant. Damaji immediately understood that it was Lord Vittala who had come to his rescue. 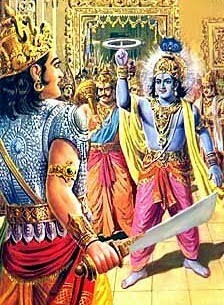 He told the King that he was blessed to have a Darshan of Lord Vittala. He also told him that he would like to spend the rest of his life in the service of Vittala and would like to take leave from the King’s service. Damaji Pant returned to Mangalwedha and found all the gifts and the receipt. He explained his wife everything that had happened and he distributed all the riches and gifts that the King had given him to the poor people and left for Pandharpur. Damaji then spent the rest of his life in Pandharpur singing in praise of Lord Vittala. 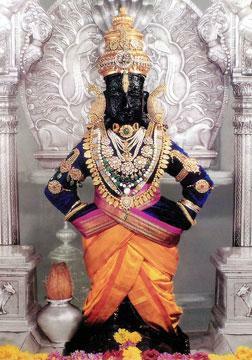 He served the Lord at Pandharpur till the very end of his life. Even now there is a temple in memory of Damaji Pant at Mangalwedha. Amita means enormous or unlimited and Ashana means food, So Amitaashanah literally means someone who consumes an enormous quantity of food. Sri Adi Sankara interprets this as ‘Samhaara Samaye Vishvam Ashnaati iti Amitaashanah – At the time of dissolution he consumes the whole of the Universe hence he is called Amitaashanah’. Sri Parasara Bhattar says ‘amitam aSnAti iti amitASanah’ meaning One who eats huge quantities. Lord Krishna displayed His greatness, among other acts, by swallowing the huge quantity of food offered to Govardhana Giri, making the cowherds exclaim in wonder – “devo vaa Daanavo vaa tvam” – “Who are you – a Deva or an Asura?” – Vishnu Puranam 5.13.121. ‘Kaarezh Kadalezh Malai Ezhulagu undum aaraa vayitraan – He who devoured the seven worlds, clouds, hills and seas is contained inside me, tightly’ (NammAzhwar’s Thiruvai Mozhi 10.8.2). Meaning: I am the fire of digestion in every living body, and I am the air of life (inhaling and exhaling), by which I digest the four kinds of foodstuff. Sri Satyadevo Vasishtha gives the above interpretation, as well as an alternate interpretation – Amitaan praaninah Ashayati bhojayati iti Amitaashanah – He is Amitaashanah because He gives unlimited supply of food to His creation, which is also immeasurable. The Dharma Chakram writer points out that we can neither live (and grow) without eating, nor live without digesting the food we eat, and both are made possible by Him, and this is signified by this Nama. Bhagavan’s love for His devotees never diminishes, and He is Viksharah for this reason. 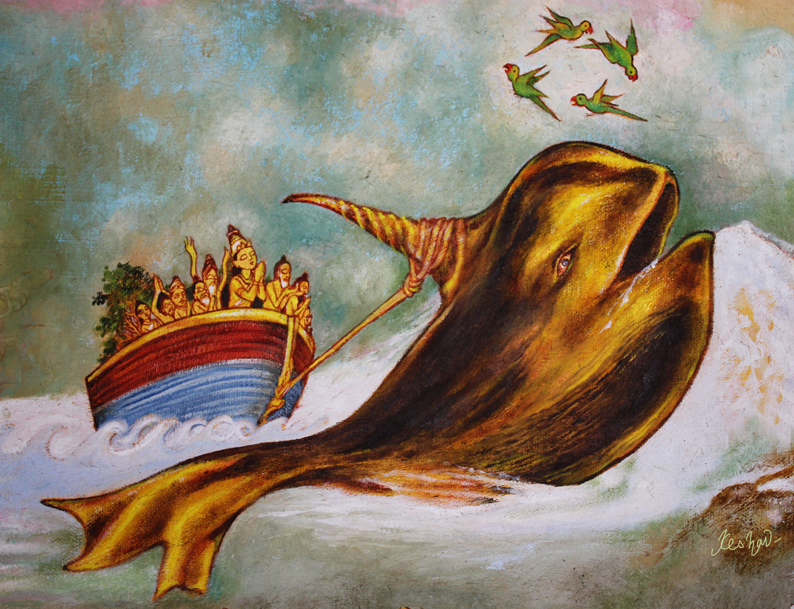 Bhagavan in His Matsya Avataar, took the form of a reddish hued fish called Rohitah, hence He is called Rohitah. Rohitah also means One who expresses Himself or One who causes all beings to express themselves. He is Maargah because He is always sought after by His devotees. 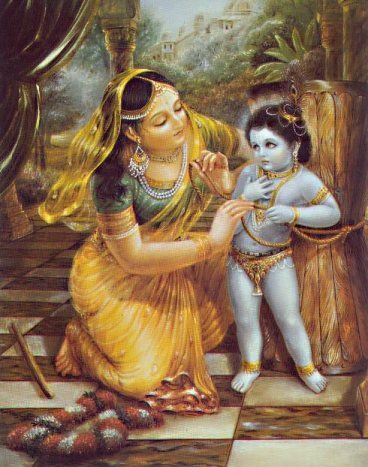 He is the cause for the realization of the desires of His devotees’. He is both instrumental and material cause of the Universe. He is called Daamodarah as has all the worlds in His belly. Daamodara also indicates Krishna when He was tied around His waist with a rope to the mortar by Yashoda. He submits patiently to his devotees wishes as he did as Daamodara and hence He is Sahah. He supports the earth and hence He is Maheedharah.He is fortunate in being able to take any form He likes, or He who gets the best of everything in His Avatars. Hence He is Maheebhaagah.He reaches His devotees the moment they think of Him because He is everywhere and all-pervading, hence He is Vegavaan. He is Amitaashanah because He gives unlimited supply of food to His creation, which is itself immeasurable. He is also Amitaashanah as HE swallows all the worlds at the time of deluge. Hari Om Uncle! I read Shloka 40 today and I liked it very much . It has a very beautiful meaning thanks . I will follow from now on. Thank you Anusha! May God bless you! Hari Om! Thank you, Shambhavi and Aishvarya. You have given two beautiful and very appropriate poems to suit the 2 names Vegavaan and Damodarah! God bless and Hari Om. Hari om! Your narration and commentary drifts us into a spiritual World. I liked the story of Damajipant and the wonderful images of Krishna. Thank you very much. Thank you Sowjanya! May God bless you! Hari Om! Hari Om Uncle! Daamodaraha is simply superb Uncle. No words. I love the first image its my favorite image of Kutty Krishna. Thank you Uncle! Thank you Shambavi! God bless you! Hari Om!